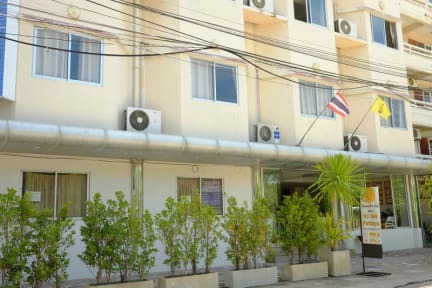 PJ Inn Pattaya is located on Soi 12 of Central Pattaya road, only 100 meters from entrance. You can walk only 15 minutes to the ‘Pattaya’ beach. It is only 5 minutes to a small local night market ‘Mae Wilai’, where you can find Thai fruits, local foods here. The guestrooms of PJ Inn Pattaya are designed for the comfort and convenience of our guests. 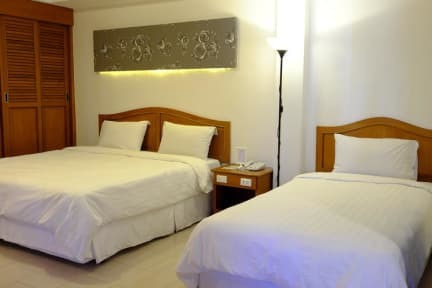 All rooms are comfort with private bathroom, hot shower, TV with international cable channel, refrigerator, air condition especially high quality spring mattress bed for your highest comfort. There is free Wi-Fi connection in all areas. Free smile and useful tourist information at reception desk. For your information, there is no restaurant here but you can find many nearby local restaurants by walk only 5 minutes. Our neighbor is a Family Mart convenient store, it is beside hotel. You can find some food and stuff here. 1. Check in time at 14:00 and check out time before 12:00 noon. (1) If you want to check in late, please notify us before your arrival date. (2) Security deposit THB500 / room pay when you check in, then return you back when check out. 2. Payment: Cash (THB) or credit card (Visa, Master) is welcomed upon arrival.